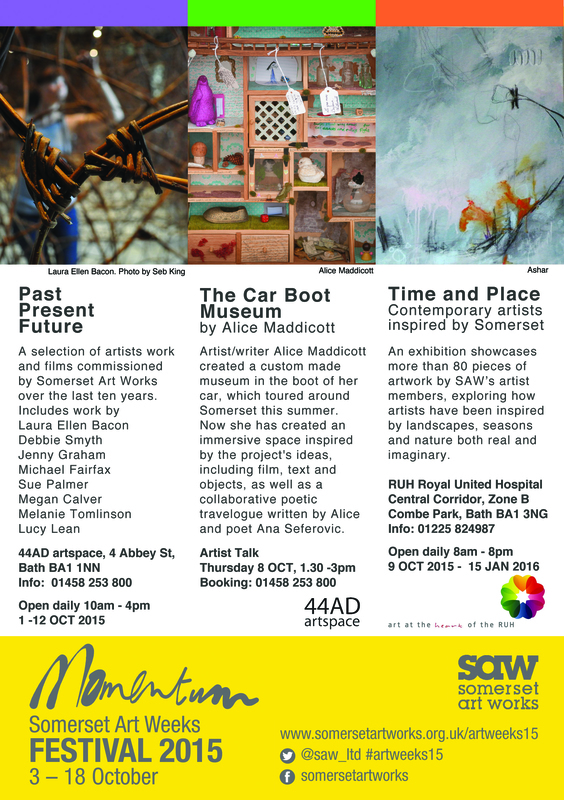 Alice’s exhibition as part of Somerset Art Weeks will be opening on Thursday 1st October at the 44ad gallery in Bath. This exhibition will be the culmination of The Car Boot Museum project seeing the launch of the poetic travelogue written in collaboration with poet Ana Seferovic, as well as the display of a film exploring ideas of memory, place and momentum, and two new large wall pieces again seeking to explore in more depth the ideas behind the project. It some ways it is an alternative “living” souvenir for Somerset, the different pieces working together and encouraging visitors to continue the evolution of the work through their own interpretation and memories. The museum will also be there to be viewed and objects and memories may be left.